I love Seattle, and after nearly four years of living here, it finally feels like home. It’s a dynamite town. It’s small yet metropolitan. Neighborhoods like Ballard, Capitol Hill, Freemont, and Magnolia boast distinct personalities yet feel cohesively Seattle. We have a good baseball team, a stellar soccer team, and a phenomenal football team (Go Seahawks!) with stadiums and fans that rival the greats around the country. Food options are diverse and ever improving to suit and challenge foodie taste buds (except for good Mexican food–we need to work on that please). 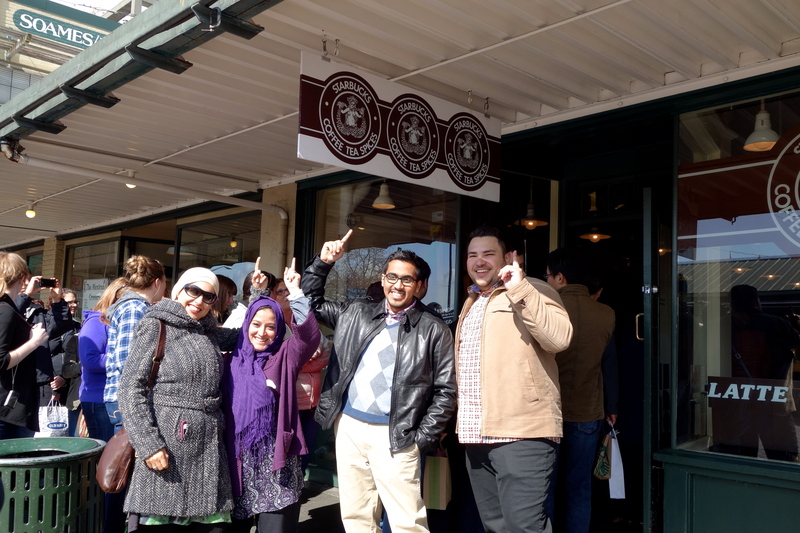 You may not like Starbucks, but these tourist think it’s #1. It’s rich with Native American, logger, Prohibition, and civic history, and its music and art culture have influenced styles and individuals all over the world. Progressive attitudes about gay rights, the legalization of marijuana and decent living wages fit right in with an intellectual community that fosters the technology and aerospace industries mixed with an outdoorsy population that has easy access to rugged hiking trails, wicked ski runs, ubiquitous bike paths, and aquatic recreation. You may be hard-pressed to find sunshine and vitamin D around these parts, but if ever you’re itching to play a round of “Find the Hipster”, you’re sure to win handily in Seattle. And let’s not forget the coffee culture–Starbucks lovers and haters all find a happy home here in Latte-land. The sad thing is, I don’t get to enjoy the city all that much. I live in a suburb about 20 minutes north of downtown, I travel pretty frequently, and when we’re home, my partner Rick Steves and I like to settle in and just be…at home. And I’d argue that many people are in a similar rut–they don’t take advantage of their hometowns as much as they ‘d like. Life just gets in the way sometimes. The grass is always greener in some other city or some other country. And sometimes we forget just how good we have it in our own backyards. So when family or friends come to town for a visit, I relish the opportunity of showing them around. As much as they want to see the popular sites and enjoy their vacation, I, too, want to be a tourist and see my city with wide-eyed wonder and embrace all that it has to offer. Autumnal colors that decorate the Washington Park Arboretum are a welcome any local or visitor to become a nature tourist. 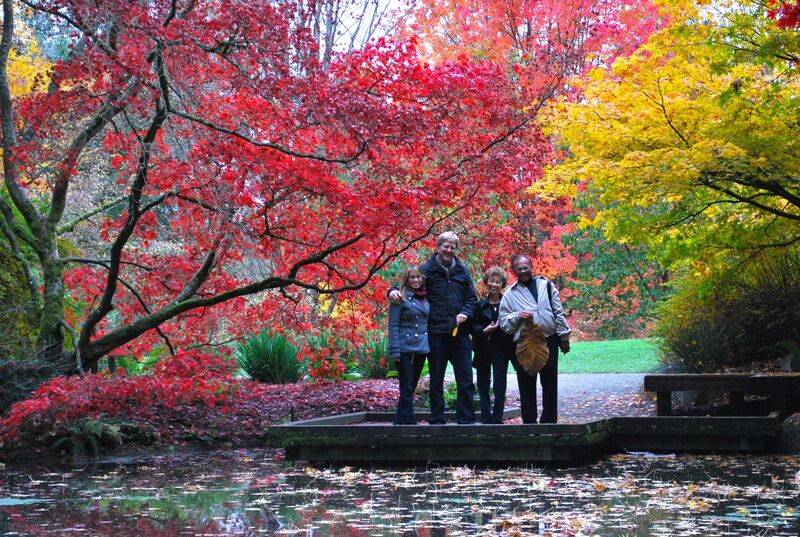 In autumn, the Washington Park Arboretum is a must see and is mere minutes from downtown. Moving from San Diego to Seattle, I had never lived through seasons–there we just have sunny, mostly sunning, and a rare and strange phenomenon call rain. Seeing nature’s palette morph from emerald, parsley, jade, and forest green to ruby, merlot and cinnamon red, pumpkin and sunset orange, and golden squash yellow is a marvel to me. Exploring even just a fraction of the arboretum’s 400 acres with Rick and my parents was a reminder that God is the greatest artist, and all His creations are masterpieces. 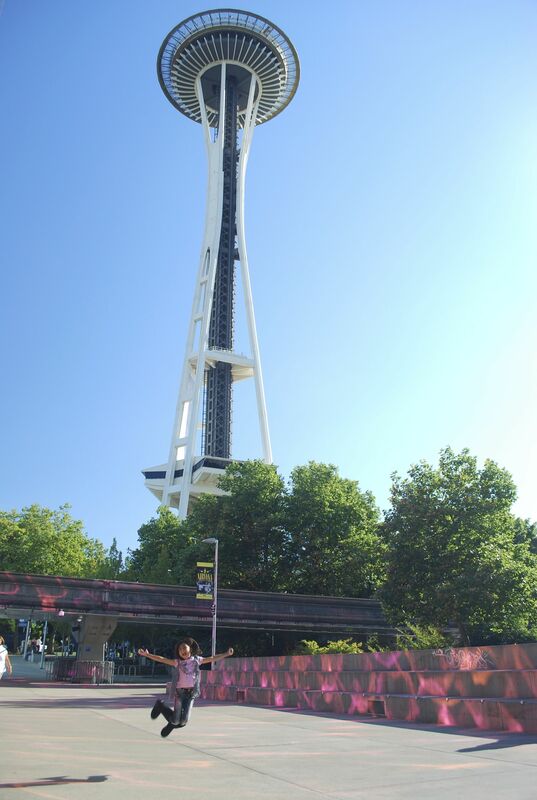 My niece Dylan jumps for joy at the Space Needle. Typical tourist sites are great anytime of the year and are the perfect spots for your obligatory vay-cay selfies. Catch a fish that flies in the flower-scented halls of Pike Place Public Market. Go round and round on the waterfront Seattle Wheel and pretend that you’re on the London Eye. Have a fancy dinner on the top of the Space Needle and ruminate on the thought that 50 years ago, this icon was the veritable homing beacon for the Seattle World’s Fair. Walk through Capitol Hill and visit the bar where Nirvana had their first concert and Grunge ripped its plaid-shirted, stringy-haired way through the fabric of the American music scene. 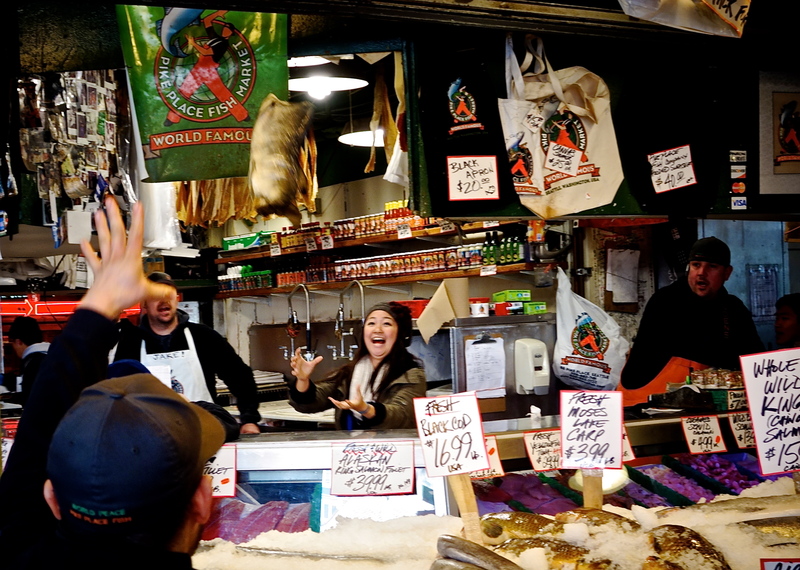 Try your fish-catching skills at Pike Place Market. 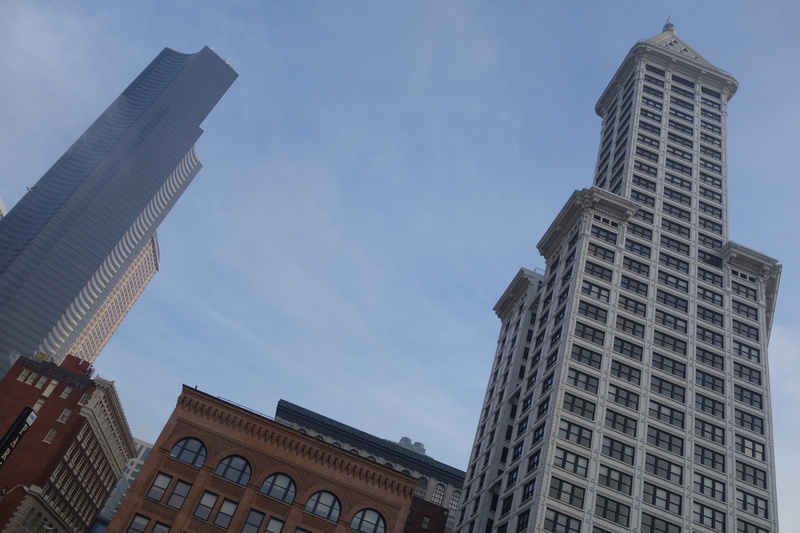 The Smith Tower (right)–once the tallest building west of the Missisippi–still has fantastic views and historic features that c its newer neighboring structures can’t beat. But when everyone who visits you wants to go those places, it can sometimes get old. Instead, my visitors get a look at the underbelly of Seattle with the Seattle Underground tour. The cityscape we know nowadays sits atop remnants of a then-burgeoning pioneer and lumber town with wooden buildings that escaped the fire of 1889. When it came time to rebuild the city, the urban planners added land to the coastline to expand the city’s footprint further into Puget Sound and used the timber-house skeletons to serve as a physical foundation for the re-envisioned 20th-century city. That era ushered in the monumental buildings made of steel and concrete. The 38-storey, 489-foot tall Smith Tower, built in 1914, was the tallest building west of the Mississippi for 17 years and the tallest on the west coast until 1962 when the Space Needle was built. Today it houses one of the oldest, functioning cage elevators (with live elevator operator) in Seattle and still has some of the best views of the city. This amphibious vehicle from the 1940s is now an icon of Seattle tourism. 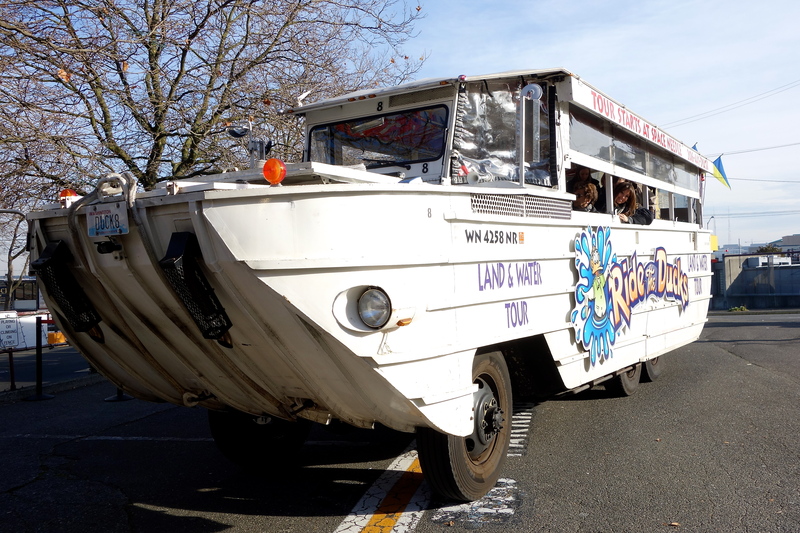 With all the rain we get in the Pacific Northwest, it’s no wonder people say that Seattleites have webbed feet, and it’s no wonder we’re home to the world famous Duck Tours of Seattle–a novel and surprisingly educational way to get an entertaining overview of the city. On a recent visit, Rick and I hopped on a Duck (an amphibious vehicle from the World War II era turned tourist transport) on a whim with my parents. Our zany driver/guide drove us all around Seattle and into the waters of Lake Union, all the while sharing fun facts and tidbits about the history, architecture, and culture of Washington’s great second-city. If you like corny jokes, whacky music, trucks that become boats, efficient use of time, and learning from a guide who’s passionate about what he does, this tour will quack you up. 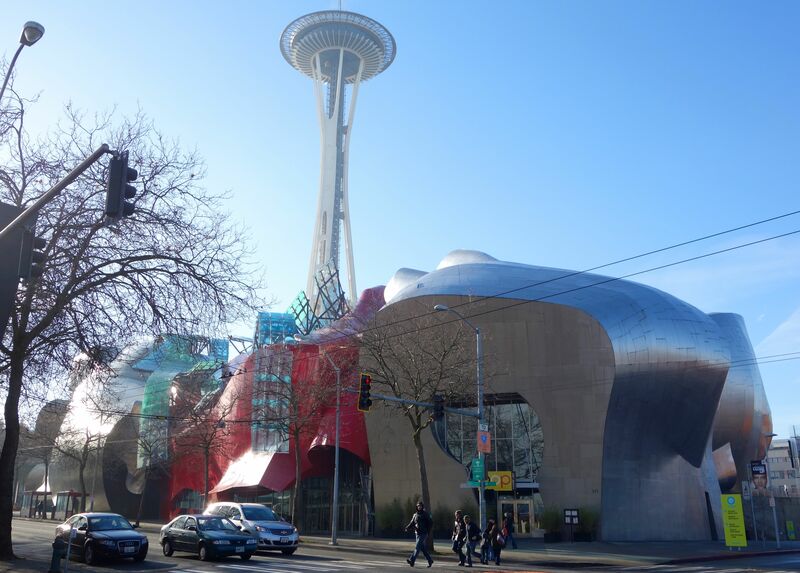 Situated on the Seattle Center campus, the Frank Gehry-designed Experience Music Project is a must-see for music lovers. Culture vulture friends of mine love wandering through SAM (the Seattle Art Museum), the newly opened MOHAI (Museum of History and Industry) at its Lake Union waterfront venue, and the incomparable Dale Chihuly Garden and Glass Museum (stayed tuned for un upcoming post on this jaw-dropping site). Ogle the Frank Ghery-designed exterior of Paul Allen’s (of Microsoft fame) EMP–Experience Music Project. Inside you can experience the sonic works of Seattle’s most famous music artists like Jimmy Hendrix and Nirvana, and you can even create your own music video. 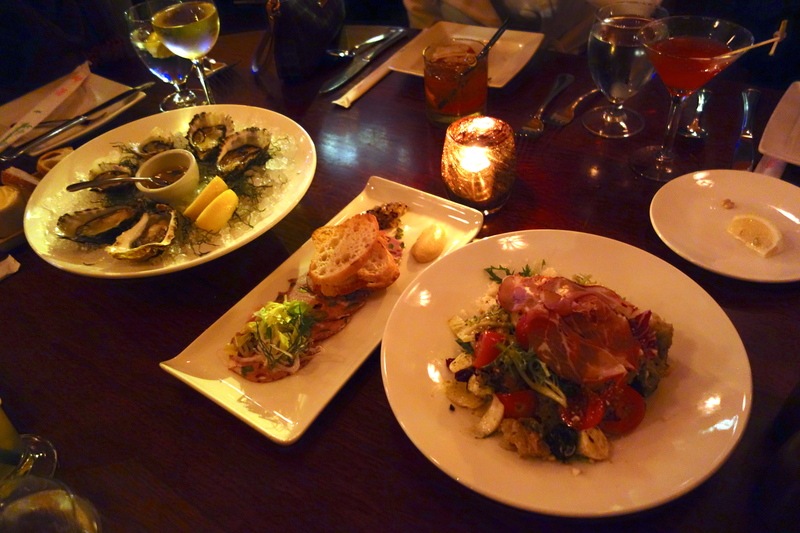 Tom Douglas and his talented crew at Dahlia Lounge craft tasty morsels with Seattleite flair. For the foodies, Tom Douglas is a name to remember, even if you can’t remember the 14 restaurants he owns in the Seattle area. As the preeminent chef of the Emerald City, he conjures distinctive tastes for each of his culinary venues that reflect not only a Pacific Northwest seafood and earthy palette but also Italian, Middle Eastern, Asian, and comfort food cuisines. And if that doesn’t suit you, try a food tour through Capitol Hill to find something that’ll tickle your taste buds. 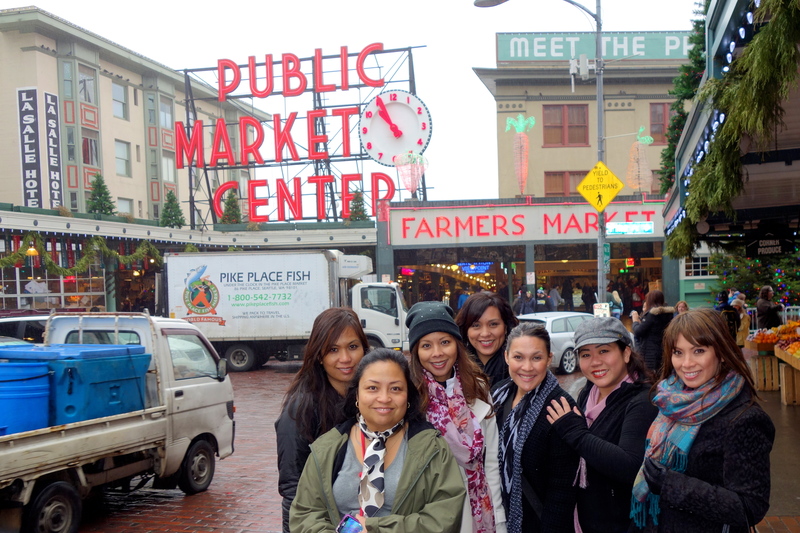 I’m thankful for dear friends like these who come to visit me in Seattle and get me to be a tourist in my own town. Residing in a place and really living in it are two very different things. We often choose to live where we do because of what that place has to offer, but if we don’t take advantage of its assets, it defeats the purpose being there. There’s so much to do in my newly adopted hometown, and I know I’ve only scratched the surface. The more I explore Seattle with visiting friends and family, the more I appreciate its history, understand its present, and am committed to its hopeful future. My challenge to you: Come up with ten things you would explore as a tourist in your own hometown. Where would you take your friends and family if you were the tour guide? Share your ideas with The Travelphile Community, and turn us on to the place you call home. My list of places to explore in Seattle is still long, and it seems to keep growing all the time. So the next time you’re in Seattle, let me know. We can be tourists together. We have been visiting Seattle for 30 years from Northern California. My husband has family there. We at one point thought about a move up there, but too dark and wet for me. The sights really are endless and what beauty! 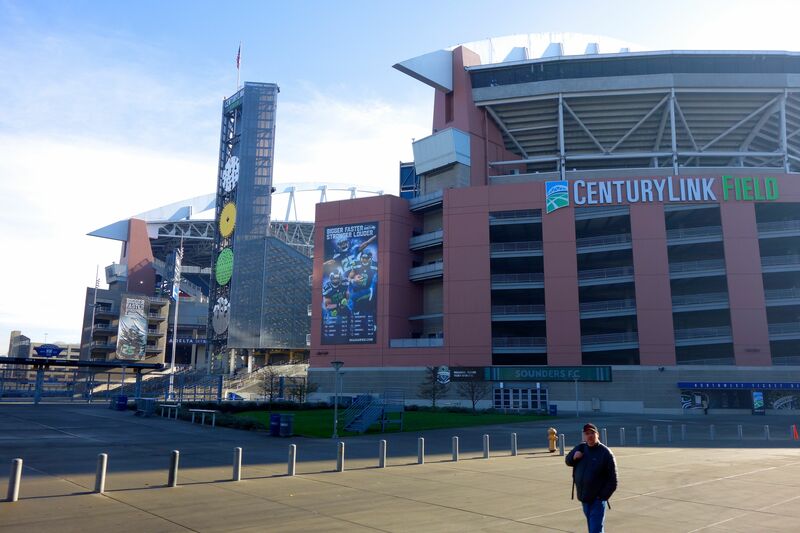 What brought you up to Seattle from sunny southern California? Hi, Judy. Love and a shift in careers is what did it for me. I was a high school Spanish teacher and wanted to earn a degree in French so I could teach that, too. The University of Washington was the ideal place for me to do that. Interestingly, I’ve since shifted from teaching high school students about language to teaching (as a European tour guide) people of all ages. I agree that Seattle could be an easy place to get used to; it’s rich and beautiful, friendly and warm (I don’t mean the weather). We really enjoy our visits there with you guys. We’re glad you’re all settled in! Those are still on my list of places to visit, Maria. I’m considering doing one Seattle site a week in February and March; I just hope I follow through on my plans. I know what you mean. I’ve lived in San Diego all my life and hardly get out to explore the city. My goal is to start exploring more. Do it, Katherine! San Diego is such a great city, not to mention all the amazing things in the rest of the county. As much as I wish I would explore Seattle more, one of my biggest regrets since leaving SD is that I didn’t take better advantage of living there and enjoying its numerous sites and activities. After traveling in Italy for three weeks (with Thanks to Rick’s guidebooks! ), I resolved to explore my home town and environments with the same enthusiasm and curiosity. I love to travel and can’t afford to do three week trips every year. I can afford to explore my own “backyard” on my days off. I started a blog to keep me on my toes, push me to explore, and experience it deeply enough to share online. I think it has worked. That’s a great point, Colette: not just exploring your own home town, but doing it with the same passion as you would for a city on another continent. Kudos to you for following through on your resolution–keep it up! I am originally from Southern California too, Trish, but the longer I live in Washington (and work in British Columbia), the more I love it! So many travel choices exist nearby: Vancouver, Victoria, Bellingham, and Seattle, all of which offer wonderful sights, sounds, smells, and tastes that both please and perplex us at the same time. Like you, I do miss good Mexican food so I indulge whenever I am in LA/Long Beach. Spring in Washington is my favorite time as I love the wide variety of tulips in the fields and the markets. Some are large, others are small, some are pointed, others are lacy, and many are striped. They are all beautiful, and I bring armloads of them home for my own pleasure and to give as gifts to others. I also love chocolate in Seattle so when you have time consider visiting the Theo Chocolate factory in Fremont for a tour. Best wishes, and thank you for your blog/posts. You’re so right about the numerous nearby travel options. Victoria is a gem, and I can’t wait to get back up to Vancouver again–next time, I think I’ll take the train for the experience. And I am definitely a sucker for Theo Chocolate!